Tracing and Writing Letter Worksheets. Using the letter worksheets below children will learn how to write alphabet by tracing and writing every letter. There are 27 worksheets in this set: one worksheet for each letter of alphabet and a blank writing worksheet. 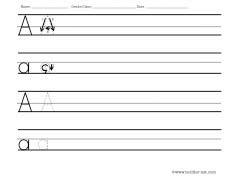 Each letter worksheet has two rows of both capital and small letters: one row for tracing and one for writing. 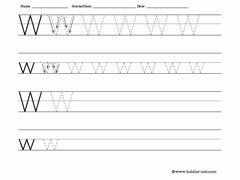 These worksheets will help children to transition from tracing the letters to writing those letters independently. You can introduce these worksheets once your kids can comfortably trace each letter on our letter tracing worksheets. 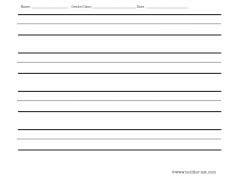 After tracing/writing worksheets you can start using our letter writing worksheets. For younger kids we have simple letter flashcards and letter worksheets for preschoolers. Letter tracing worksheets first step in learning how to write letters. These worksheets have full page of letters for tracing. Letter writing worksheets have plenty of space for independent writing. You may also like: Cursive letter worksheets for tracing and writing.